When young players watch college or pro hockey, it's usually the precise shots and graceful moves of goal scorers that attract their attention. In some ways this is easy to understand, since scoring goals is what wins games. What’s not so easy is helping kids understand that very few goals happen without a great pass (or two, or three). And goal scorers probably wouldn’t have gotten their chance if they hadn't taken some initiative to get open for a pass in the first place. Just as much as goal scoring, these overlooked skills are critical pieces in a young player's game, but often it takes hard work and repetition to get them right. According to Chris Nagy, assistant coach at St. Mary's High School in Lynn, Mass., one of the most important practice techniques to teach players to make and receive good passes is small-area play. Shrinking the ice and learning to make plays and move in small areas forces young players to move and react more quickly. Moreover, the speed of these drills limits the time players have to move from forehand to backhand. Passing, it can’t be emphasized enough, is a two-step formula. The greatest pass in the world won’t help the team if the receiving player can’t handle it. So passing drills must focus on both the passer and the passee. "Not every kid is blessed with the softest hands,” notes Nagy. “Repetition with these drills can help overcome that. Practicing the backhand is more important now. It seems like young players don't work on it as much anymore. Drills that develop that skill can turn a good player into an elite player." Like with other skills, Nagy employs a number of drills with his team to help create a more well-rounded passing game for each player. 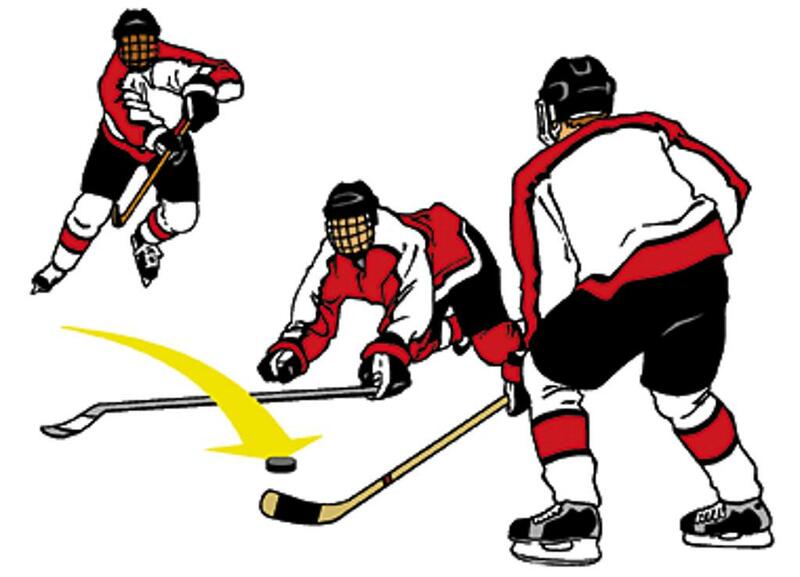 The pass itself is obviously vital, but learning when to make a pass and how to support teammates by skating and accepting passes is just as important. "One of the best drills is a two-man drill," Nagy says. "Just set up some cones, you can use anything really as a barrier, about seven feet apart, and make a pass to your teammate. They'll accept the pass and move to the other cone and pass it back. Doing this over and over helps players get more comfortable making and receiving passes quickly." The benefits of this drill come mostly in the repetitive nature of it. Over time, the rapid back-and-forth creates a comfort with puck-handling that translates well into games. Nagy says it's important for players to accept and send passes on the forehand and the backhand in this drill. Learning to seamlessly accept passes on the move also requires practice. Nagy has another drill he relies on for this skill. This drill takes an additional player, but it also teaches players to make lead passes and move the puck without stopping. "Three players line up about 10 feet from each other and make passes to each other," Nagy says. "The player in the middle can also move back and forth in figure eights to make passes on the move and get more comfortable accepting passes while skating." No matter the level, becoming a better passer is important for any young player. Improvement doesn't come without repetition, practice and hard work. The benefits, though, are well worth it.